I had an amazing Easter Sunday. I was standing at the top the Fire Island Lighthouse watching the sunrise. 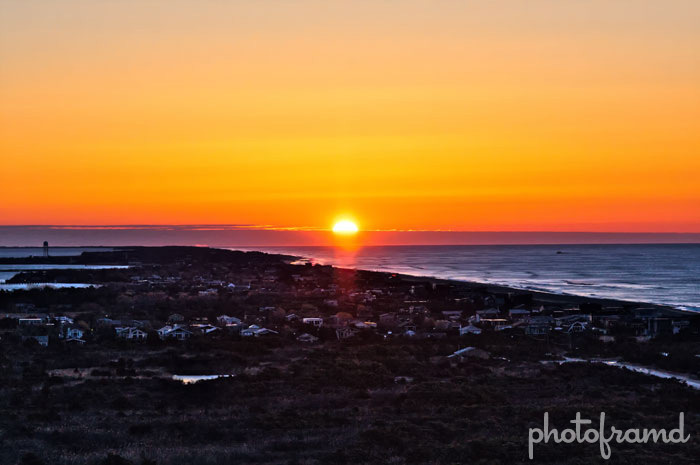 This was the first time the Fire Island Lighthouse Society ever had a sunrise watch, and I hope they repeat it soon. However, the conditions were surprisingly brutal. At 170 feet off the ground and winds over 30 MPH, the windchill was easily below zero. Although I had my tripod, I was afraid that it would make my camera a very expensive projectile. The wind was that strong. So, my hopes of some HDR shots were out. Instead, I decided to fake it with LightZone 3.5. It’s amazing what LightZone can find in an image! It analyzes the image’s luminosity on a 16-zone scale, similar to an expanded Ansel Adams “Zone System”. By manipulating these zones, LightZone finds details hidden deep in the digital data. Version 3 makes it even easier by adding direct import of CameraRaw files, and pre-set filters with unlimited stacking capability. Their website has a great Learning Center filled with videos showing the breath of this program. All filters are dynamic and can be moved around, restacked and turned off to test results. It is easy to just “play” with all the different settings. Each preset starts with a default setting, but can easily be tweaked with sliders. I started with the Relight filter to bring out the hidden homes in the darkness. Then I applied the Clarity filter to sharpen the revealed details and boosted the saturation with Hue/Saturation filter. I applied the ZoneMapper filter to bring back some of the darkness in the shadows while maintaining the overall image balance in the remaining areas. Finally, I applied the Toning Shadows filter just to define the shadows a little more. That’s it. Pretty cool! I did introduce noise into the image, and experimented with LightZone’s built-in Noise Reduction filter. But, I liked the results from Topaz Labs Denoise better. 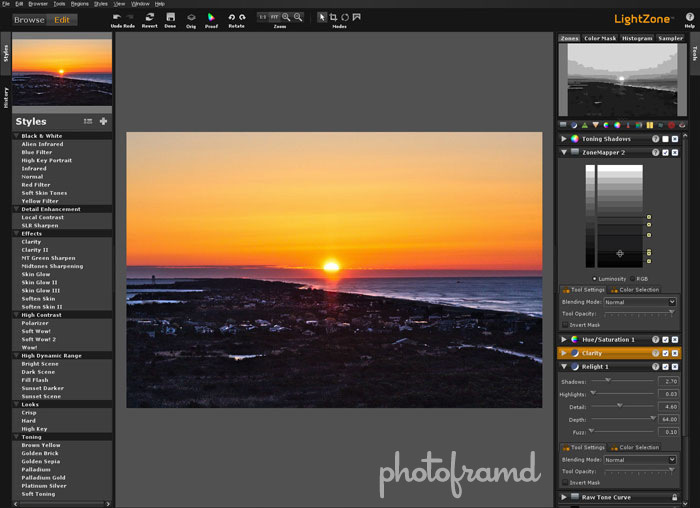 Now for the negative: LightZone is NOT a Photoshop plugin; it is a stand-alone application. Therefore, it is more like Lightroom or Aperature than Photoshop since it does not have any direct “painting” tools in the program. There is a 30-day trial version available on their website. So download it and watch the videos. If you Google, you can also find a discount coupon. So, see what you can find in your photos with LightZone. LightZone not being a Photoshop plugin is a great plus, not a negative. Not everyone uses (or can use, I’m on Linux) Photoshop.